Book Your Own Guided Painting Party! 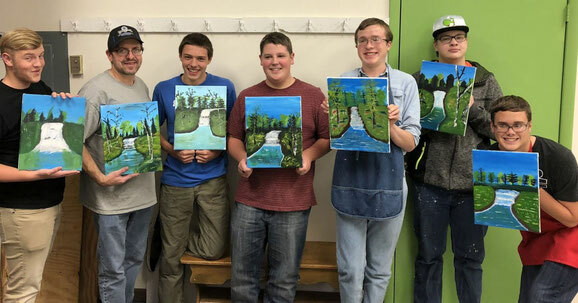 Book a private guided painting party or event for a date night, father-daughter event, girls’ night out, youth group activity, birthday party, team-building activity, or -- whatever! Everyone will enjoy an evening (or afternoon) of fun, food, and drink, while completing a canvas painting in 2 to 3 hours. Choose from one of the paintings in our Gallery or select a theme and we will provide a fun new painting for your group (for an additional fee). Bring your own snacks and (non-alcoholic) beverages. If you wish to bring a bottle of your favorite creative courage sipping beverage, we can do that! Please let us know in advance. Parties that include alcoholic beverages (wine or similar beverages - no beer or hard alcohol allowed) will be limited to adults only (21+), and all participants must sign individual Release of Liability / Alcohol Waivers. All parties include 11" x 14", 12" x 16," or 16" x 20" canvases, all painting supplies, instructions, and individual assistance. Booking fees are $20.00 to $30.00 per person (minimum four participants) plus a $30.00 "new subject" fee if you request a new painting to be designed for your group. Please allow at least two weeks prior to your event for a new painting subject or theme to be created just for you and your group! Youth groups will receive a reduced rate depending upon the number of young artists and the project and/or canvas size. To book a party, please click on the Contact Us tab above and provide the type of event, the general age group, your desired date and time, and whether you plan to allow wine at your party. Also please indicate the type of painting (theme or subject matter) you would like to do. We have smaller sizes or canvas panels available at reduced fees - just ask! You can also download and print our Painting Party Booking Form below. Just fill it out and mail or bring it in to the Art Center - you'll want to call first to confirm your desired date.